The 12-slot periodical sorter is made of strong steel so that the organizer can be placed in busy work or commercial settings. 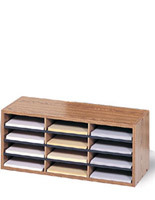 The tan color on the literature holder will help it to blend in with many settings. A periodical sorter for countertop use is able to keep brochures and papers at a good viewing height for customers and employees. 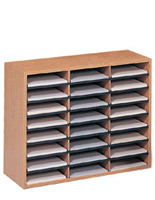 The display also functions as a mail organizer as well, best used in an employee break room or lounge to make sure the right papers get to the right person. 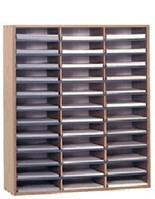 The sorter is a great literature holder to keep specialty papers and letterhead separate in an office setting. 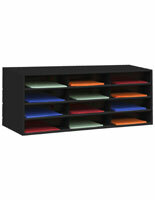 Brochures, magazines, and catalogs all fit easily into the 8.5” wide compartments of the display for easy retrieval.